In the early 1980's, new B.P.R.D. 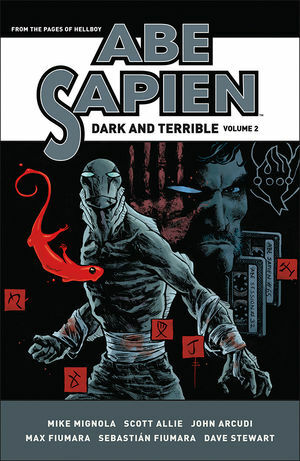 agent Abe Sapien was set to retrieve the corpse of a powerful warlock off the coast of France. Abe quickly finds himself in a battle with a century-old evil in the form of demonic monks. This mission, along with tales involving a haunted lake, South American vampires, and a mad scientist seeking out mans missing link are collected here! Collects Abe Sapien Vol. 1, 2, and 9. ''As it comes to its inevitable end, finding people struggling for their own basic humanity reflects the search that Abe and Hellboy both have undertaken over the past 25 years.'' --AiPT!